The salient feature of this note series is colour. Apart from the strident red of the $50 bill, they still adhered to the basic colour themes of Canadian bank notes. But, variations of accent colours fade and float throughout all the notes, prompting Bank staff to call it the ‘multicoloured series’. The almost organic geometric patterns that sway and twist around the edges represent an updated version of ‘guilloche’, the machine-made ‘spirograph’-like patterns traditionally seen on older notes. These are not just beautiful details, but security features designed to make reproducing the notes extremely difficult. 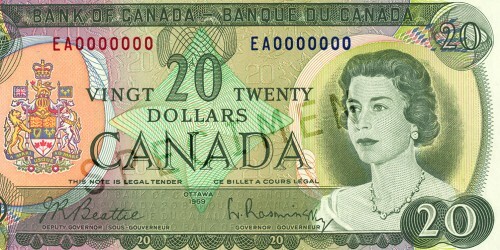 The finance minister of the time, Edgar Benson, decreed that the notes should feature Canadian prime ministers throughout most of the series, setting the basic theme for all future notes. On the reverse, this series did not feature ‘the great lone land’ but a landscape that is transformed by humans, both by traditional activities and with industry. But it is the $50 bill, released a decade after the series’ conception, that stands out in many people’s minds. The vignette of the RCMP Musical Ride is out of keeping with the rest of the series, having no landscape view and boasting a full-colour image. The strikingly rich, layered colours of this iconic Canadian image could only be achieved affordably through the lithographic process. It was the first Canadian bill to have an entire side lithographed. This bill was a bridge between the past and future: with each succeeding generation there would be less engraving and more lithography in the imagery of our bank notes. 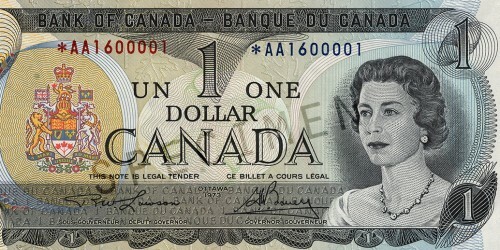 The $1 note was issued in June 1974 and printed by both Canadian Bank Note Company Ltd. and British American Bank Note Company. This was the last $1 note issued by the Bank. Issued in August 1975 and printed by British American Bank Note Company, the $2 note features an Inuit hunting scene based on a photo taken by Doug Wilkinson at Pond Inlet on North Baffin Island. The $5 note was issued in December 1972. 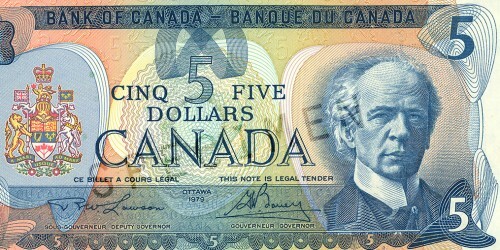 The portrait of Sir Wilfrid Laurier on the face of the note was engraved by C. Gordon Yorke. 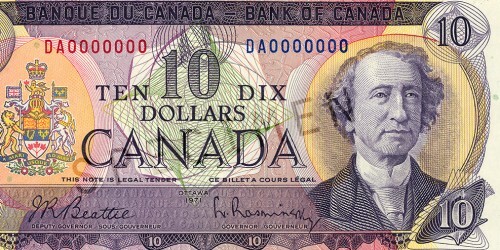 A portrait of Sir John A. Macdonald engraved by George Gunderson appears on the front of the $10 note. The back features the Polymer Corporation in Sarnia, Ontario. 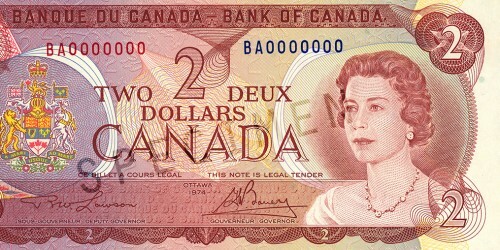 The first $20 note in the series was issued in June 1970 and was printed by both Canadian Bank Note Company Ltd. and British American Bank Note Company. The face features the Gunderson engraving of the Queen. 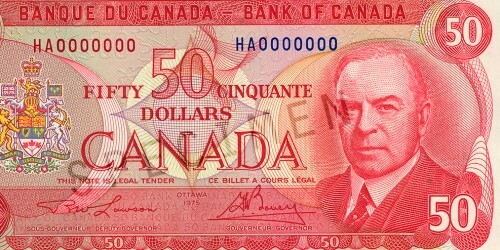 The face of the $50 note features an engraving of William Lyon Mackenzie King by George Gunderson based on a Karsh portrait of Canada’s longest-serving prime minister. 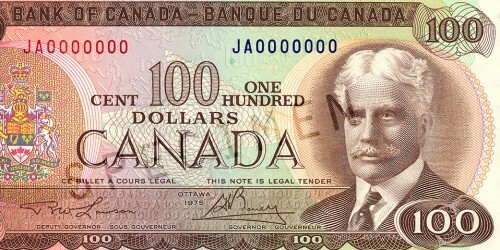 C. Gordon Yorke engraved the portrait of Prime Minister Sir Robert Borden that appears on the front of the $100 note. C. Gordon Yorke engraved the vignette of the harbour at Lunenburg, Nova Scotia, featured on the back.